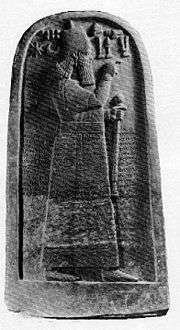 Adad-nirari III (also Adad-narari) was a King of Assyria from 811 to 783 BC. Adad-nirari was a son and successor of king Shamshi-Adad V, and was apparently quite young at the time of his accession, because for the first five years of his reign, his mother Shammuramat was highly influential, which may have given rise to the legend of Semiramis. It is widely rejected that his mother acted as regent, but she was surprisingly influential for the time period. He was the father of kings Ashur-nirari V, Shalmaneser IV, and Ashur-dan III. Tiglath-Pileser III described himself as a son of Adad-nirari in his inscriptions, but it is uncertain if this is truthful. Agate beads with the name Adad-nārārī III from Khojaly: Manneans period in the National Museum of History of Azerbaijan. Adad-nirari's youth, and the struggles his father had faced early in his reign, caused a serious weakening for the Assyrian rulership over Mesopotamia, and gave way to the ambitions of the most officers, governors, and the local rulers. According to Adad-nirari's inscriptions, he led several military campaigns with the purpose of regaining the strength Assyria enjoyed in the times of his grandfather Shalmaneser III. According to the eponym canon, he campaigned in all directions until the last of his 18 years of reign (783 BC), and he was the builder of the temple of Nabu at Nineveh. Among his actions was a siege of Damascus in the time of Ben-Hadad III in 796 BCE, which led to the eclipse of the Aramaean Kingdom of Damascus and allowed the recovery of Israel under Jehoash (who paid the Assyrian king tribute at this time) and Jeroboam II. Despite Adad-nirari's vigor, Assyria entered a several decades long period of weakness following his death. ↑ Ancient Near Eastern History and Culture by William H. Stiebing Jr.